Coming from only a two-week vacation break in high school, the month-long hiatus between the Fall and Spring semesters opened up many doors for the opportunities I could take over Winter break. The best break idea out there is definitely hitting the slopes. Every Winter my family and I take a snowboarding trip anywhere across the country. In the past, we’ve gone to Colorado and Wisconsin, but this time around we decided to head up to Northern Michigan to a nice little town of Bellaire to where we could take our adventures. We rented out a nice AirBnB house. It had a huge living space meant for a family of 5 or more, but my 4-person family cozied right up there and made it our home for a few days. We drove the 5-hour drive to Northern Michigan so thankfully we had a car handy with us, or I don’t think the mile walk to the resort with our equipment would’ve been fun. We spent our time snowboarding and finding our favorite slopes while also taking break time to eat hot soup and drink hot chocolate. When I got back to Madison, I missed the slopes. There’s something about the wind rushing past your face and the sparkling snow that left me wishing I was back there, and I’m sure you’ll feel the same way! 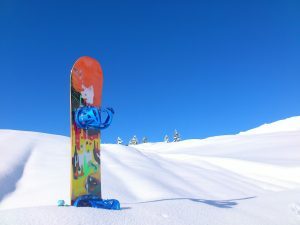 Even if you don’t know how to snowboard, it’s easy to learn. Either that or skiing! Whatever you choose to do over your Winter break, skiing is a great way to spend time with friends and family.